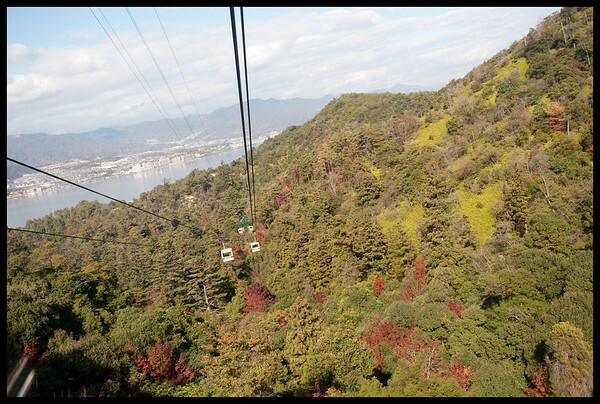 Is how I would have describe my Miyajima trip. After traveling for more than 3 hours by Shinkansen, train, and ferry. I arrived at the famous island of Miyajima with its many historical and unique cultural sites. 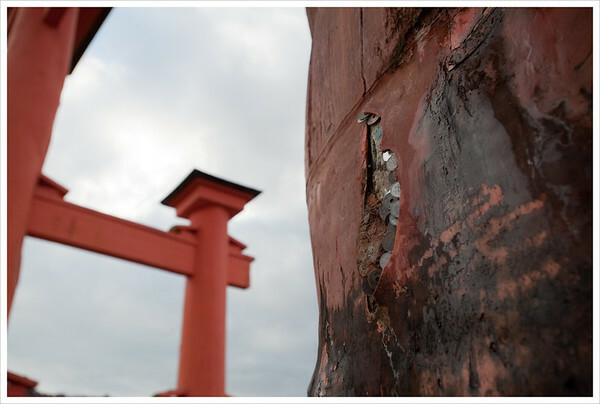 I also had the fortunately luck of seeing the huge torii up close and personal during low tide. An interesting point to note i s that people love to jam coins into the many cracks on the pillars as well as try to throw rocks onto the many supported beams. For one, deers. Surprisingly I didn’t see any of them on the main land though. I wonder how they got here on the island. 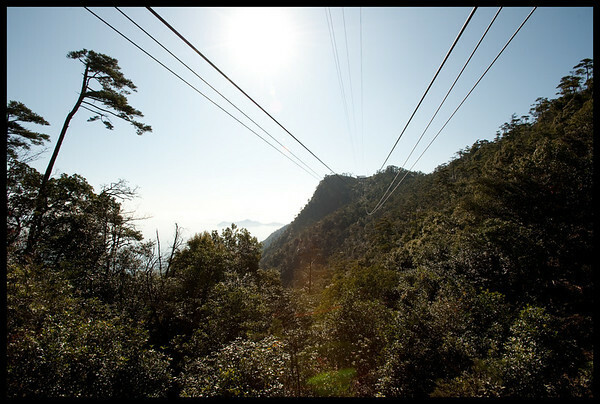 Monkeys as well be careful of them though they are only found at the peaks of mount Misen so no worries there. 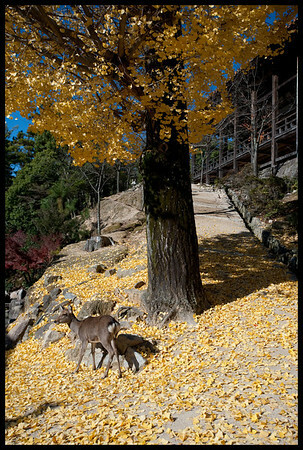 As for autumn it was almost over, only in the low land areas could you find any autumn leafs at all. Though that was also where all the deers dwell looking for food. The photo you see here was taken exactly 30 seconds before I was chased away by its mother for being so close to her fawn. No I didn’t get rammed by one this time, took off like a rocket when I heard the hoof steps. 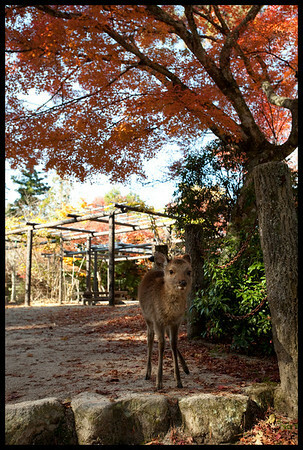 A note for those who are planning to go there, while it was alright to feed the deers in Nara, this practice is actually not allowed in Miyajima else the animals would be dependent on hand outs. The exclusion to this law is that you can feed them leaf, and berries you find on the ground. 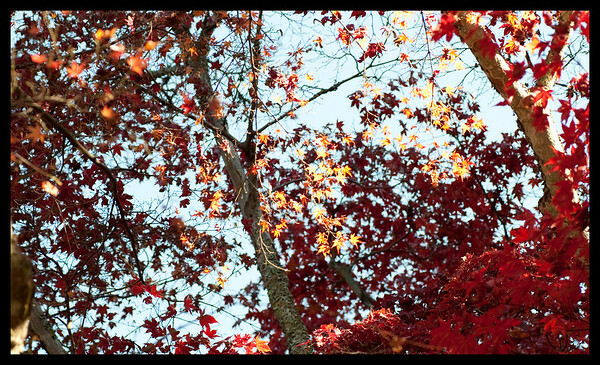 They especially have a liking to red maple leafs. Weather wise was pretty good till noon, I was halfway up mount Misen when the weather turn cloudy and dark. I immediately started to make my way down the mountain as I did not wanted to get caught if it had rained. (It didn’t but remained dark and cloudy nonetheless). Still the first half was brilliantly beautiful with the sun shining brightly on a clear blue sky. 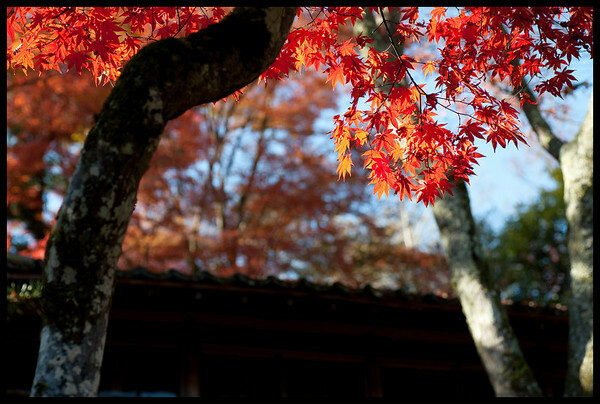 As always I spent most of my time at Momijidai (Maple leaf big? Can someone else translate this name?) and a half way up mount Misen at its second base station. 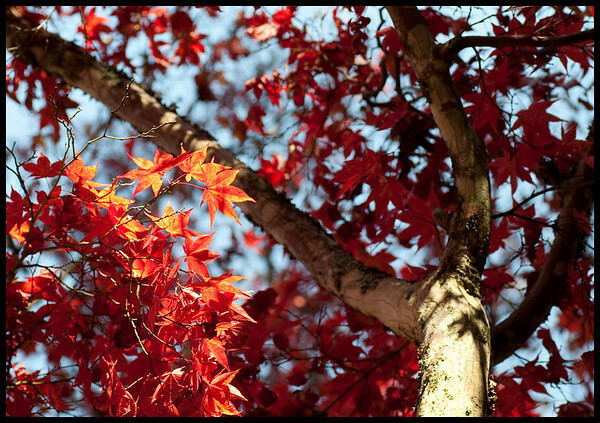 Though not all of the maple leafs have fallen, some have instead intensify further giving a very eerie blood like color. Okay I admit I did cheat a little this time and went up a good portion of the way up mount Misen by cable car but when I tried to hike up the rest of the way, weather turned bad I made my way down by foot so it sort of even out. Though the view up there was fantastic even at mid point. I can only imagine how much better it is up at the peak. 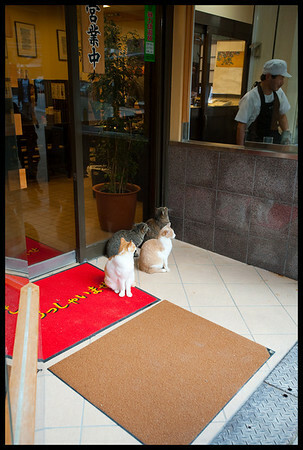 On my way back to the pier, I noticed a brilliant way of attracting customers, this seafood restaurant seems to always have number of stray cats (I think) waiting by the front door for hand outs from the chef there (the one with the white cap). This draws a lot of customers who most likely end up going into the restaurant to try out their famous oysters (which by the way is excellent!). Holy moly! This whole trip took me 13 hours! 6 of it spent on just getting to Miyajima but well worth the effort even though daylight was only a short while. The panoramic shots took all night to process and consisted of about 20 over shots to make! 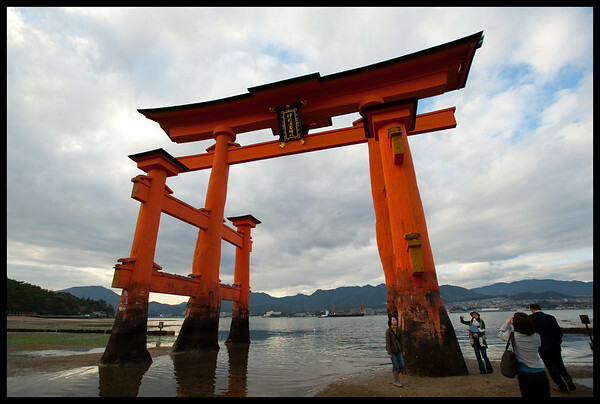 Miyajima is on my list of places to visit in Japan, so it was fun reading your entry! It looks like a really beautiful place to visit! And thanks for the tip about the deer! 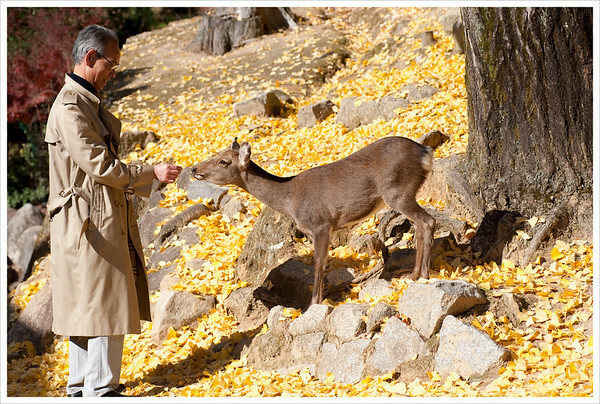 I’ve been to Nara, and fed them the cookies there, so I might have done the same in Miyajima! So thanks for the heads up, will have to try and remember that! Your panoramic shots looks gorgeous! thanks! Yeah the cats were a really good lure! And they loved to be petted!